Polly O'Leary: How many colours do you need to paint flowers? I've been thinking a lot about colour lately. Specifically, how many colours does a beginner need in order to paint a painting? Notice the word need, rather than want. 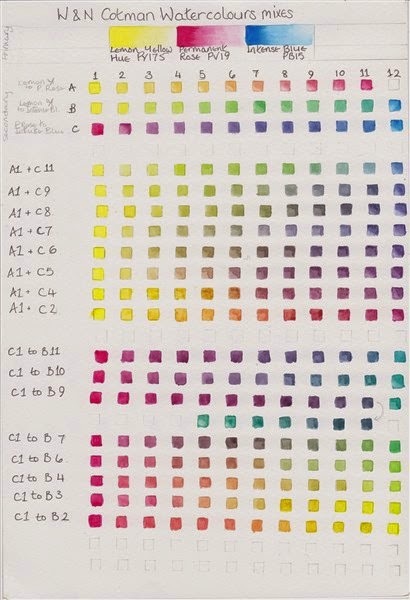 Many beginners in watercolours seem confused as to what colours they need to buy, and I'm sure many of us have bought as many colours as we could afford, thinking that more is better. Then sat around unsure as to where to begin, overwhelmed at the sheer number of colours in their kit! So with this in mind, I picked three colours which work really well together and are transparent, and set out to find out how many colours I could make with just those three colours. The answer is... a lot. I decided to keep my colour chart to just one side of watercolour paper, and a bit smaller than A4. No reason for the size apart from already having several pieces, all the same handy size. First, I mixed two of each of the colours, adding tiny amounts of one colour to another and recording the colours as they changed. I did this with each of the three colours. Then, I picked mixes of two of the colours and added tiny amounts of the third to see what colours I got. I labelled everything so that I could repeat any colour I wanted just by looking at the chart. Notice that each primary colour can be changed to either warm or cool by adding tiny amounts of one of the other colours. So you get a Warm Red and a Cool Red, a Warm and Cool Blue and a Warm and Cool Yellow. Then, as you continue adding tiny amounts, the colours change to produce a range of Oranges, Purples and Greens. But that isn't the end of the story, each of those Oranges, Purples and Greens can be further changed by adding tiny amounts of a primary colour to produce progressively warmer or cooler versions of the colour. And as you add more and more of the primary, you get a range of browns, golds and greys. All of this was done using only Cotman Watercolour paints, since this is often the paint bought by beginners, but you'd get the same results using Artist's Watercolurs too. As I was enjoying myself, I then decided to make colour charts with six colours guided by a MaimeriBlu Tryout Set I had hanging around (In the Cotman Chart below, I used seven colours as I wanted to see the difference between PG7 Phthalo Green, and PG36 Phthalo Green in the mixes) . But this time, I limited my mixes to just two of the colours, otherwise I'd still be mixing colours. So there you are, it's possible to mix a huge number of colours with just three well chosen tubes of paint - certainly enough colours for your first tentative steps in Watercolour. And it's possible to mix an almost infinite number of colours with just six well chosen tubes of paint. Good news for anyone wanting to start painting in watercolour without spending a fortune. Ha ha you've got me there Shevaun! wonder if I need therapy? Colour therapy maybe? Thanks Polly, very helpful and very useful. This is a very useful post. Thank you, Polly. Thank you for your comment Tatiana. I love sharing useful hints and tips - it's how I learned too.